Home » »Unlabelled » Manipal University organizes first Blood Donation Campaign of the year. Manipal University organizes first Blood Donation Campaign of the year. 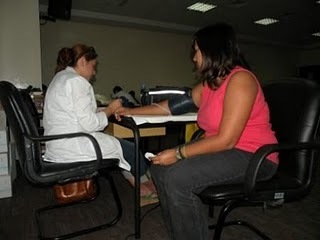 Manipal University organized its 9th Blood Donation Campaign on the 4th and 5th of April 2010. This campaign was undertaken by the Blood Donation Centre at Al Wasl Hospital and was held in the University’s auditorium from 9am to 3pm. The students from the Biotechnology Department volunteered to take charge of the event, helping the donors in any way possible. Blood donation is not only helpful to those who are in need, but is also extremely beneficial to the donors in several ways. - It aids heavy smokers by reducing the hemoglobin level in the blood. “First and foremost, donating blood is a humanitarian act to help people. And secondly it helps you, because when you give in blood, your body will compensate by producing new blood cells, which is extremely advantageous for you,” says Dr. Rena from the Donation Centre at the Al Wasl Hospital. Blood Donation is very important as it is a great help for those people who need it. For cases like Thalassemia and Leukemia as well as those involved in accidents and other surgeries, donating blood helps people everyday. It is a quick, easy and painless process helping donors as well others in need.